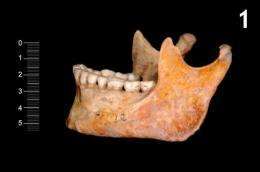 A team of scientists, led by researcher Carles Lalueza-Fox from CSIC (Spanish National Research Council), has recovered - for the first time in history - part of the genome of two individuals living in the Mesolithic Period, 7000 years ago. Remains have been found at La Braña-Arintero site, located at Valdelugueros (León), Spain. The study results, published in the Current Biology magazine, indicate that current Iberian populations don't come from these groups genetically. The Mesolithic Period, framed between the Paleolithic and Neolithic Periods, is characterized by the advent of agriculture, coming from the Middle East. Therefore, the genome found is the oldest from Prehistory, and exceeds Ötzi, the Iceman, in 1700 years. Researchers have also recovered the complete mitochondrial DNA of one of these individuals, through which they could determine that European populations from Mesolithic Period were very uniform genetically. Carles Lauleza-Fox, from the Institute of Evolutionary Biology (CSIC-UPF), states: "These hunters-gatherers shared nomadic habits and had a common origin. Despite their geographical distance, individuals from the regions corresponding to the current England, Germany, Lithuania, Poland, and Spain, shared the same mitochondrial lineage". The DNA data, which represent the 1.34% and the 0.5% of both individuals total genome, show that they are not directly connected to current populations of the Iberian Peninsula. Iberians from the Mesolithic Period were closer to current populations of northern Europe, who could have assimilated part of the genetic legacy of these hunters-gatherers. La Braña-Arintero site was discovered in 2006 by chance. Juan Manuel Vidal Encinas, archeologist from the Regional Government of Castilla y León, who has also participated in the study, has excavated it at a later date. The cave, due to its location in a cold and mountainous area, is a suitable place for the good preservation of the DNA of these two individuals, found inside it. CSIC researcher emphasizes: "So far, we only had one genome of the European Prehistory, that of Ötzi [also known as the Iceman], from the Neolithic Period. 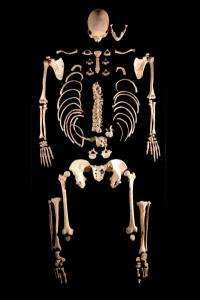 His mummy, belonging to a man who lived 5300 years ago, was found in the Tyrolean Alps, on the border between Austria and Italy. La Braña-Arintero site offers a unique opportunity to obtain pre-Neolithic genomes". According to Lalueza-Fox, this is only a first result since the intention of the team is to recover the complete DNA of these individuals, and to compare it with that of the modern humans. CSIC researcher discloses: "The arrival of the Neolithic Period brought about a replacement of populations, and could cause genetic changes in genes associated with new infectious diseases, and in metabolic genes linked to changes in diet. Therefore, all the information extracted from this genome will be absolutely important".